As with needle exchange, opposition to Naloxone distribution has mainly come from those who fear that reducing drug-related harm will lead to increased drug use. Fortunately, also similarly to the data on needle exchange, the research doesn’t find this occurring. But don’t let any actual experience bother you, LePage! It’s a strong word to use, I know. But this is evil. In LePage’s telling the addict isn’t a person. He or she is rather just the worthless meat sack that locally reverses entropy between one overdose and the next. He’s rather let those suffering an overdose die than live because, as he frames it here, the state of addiction robs the user of all other human attributes. This is how a monster thinks. I won’t say that this is the view that infects all of your modern Republican party, because on this issue it’s not. But it remains a perfectly mainstream one — one that kills. …one of the biggest misunderstandings we have about addiction is that tough love—is that being kind will fail and tough love will work. What really helps and why harm reduction, which is this idea that we will meet you where you’re at and we’ll help you whether you’re ready to stop or not—why that works is because when you have addiction, you tend to be very marginalized, self-hating. You might be homeless. You feel like a criminal. Nobody has any respect for you. And when somebody just hands you a clean needle or gives you access to naloxone and says, “I believe you deserve to live, regardless of whether you do what I want,” that’s a really powerful message of kindness. And here a plug (full disclosure: she’s a friend) — here’s Maia’s new book on addiction. *Where n is an arbitrary large number. 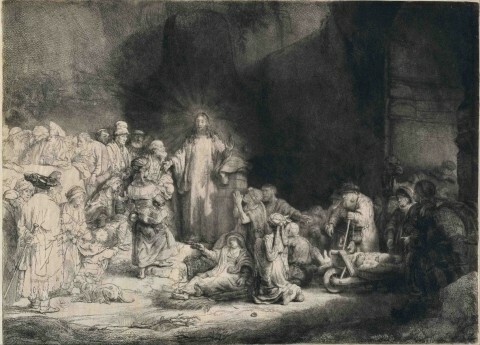 Image: Rembrandt van Rijn, Christ Preaching (The Hundred Guilder Print) c. 1649. This entry was posted on April 21, 2016 at 4:45 pm and is filed under Evil, Politics, Republican knavery, Uncategorized. You can subscribe via RSS 2.0 feed to this post's comments.